Directed or focused acoustic wave energies are central to many applications, broadly ranging from ultrasound imaging to underwater ecosystem monitoring and to voice and music projection. The interference patterns necessary to realizing such directed or focused waves, guiding the radiated acoustic energy from transducer arrays to locations in space, requires close control over contributions of sound provided from each transducer source. Recent research has revealed advantages of mechanically reconfiguring acoustic transducer constituents along the folding patterns of an origami-inspired tessellation, as opposed to digitally processing signals sent to each element in a fixed configuration   . One such proof-of-concept for a foldable, tessellated array of acoustic transducers is shown in Figure 1. We cut a folding pattern into piezoelectric PVDF (type of plastic) film, which is then bonded to a polypropylene plastic substrate scored with the same folding pattern. Rather than control each constituent of the array, as in digital signal processing methods, the singular driving of the whole array and the mechanical reconfiguration of the array by the folding pattern leads to comparable means to guide the acoustic wave energies. To date, this concept of foldable, tessellated arrays has exemplified that the transmission of sound in angularly narrow beams, referred to technically as the directionality far field wave radiation, can be adapted by orders of magnitude when the array constituents are driven by the same signal. These arrays can be adapted up to a point dictated by the foldings of a Miura-ori style of tessellated array. Our research investigates a new form of adaptive acoustic energy delivery from foldable arrays by studying tessellated transducers that adopt folded curvatures, thus introducing opportunity for near field energy focusing alongside the far field directionality. For instance, Fig. 1 reveals the curvature of the proof-of-concept array of star-shaped transducer components for the partially folded state. This suggests that the array will focus sound energy to a location near the radius of curvature. The outcomes of these computational and experimental efforts find that foldable, tessellated transducers that curve upon folding offer straightforward means for the fine, real-time control needed to beam and focus sound to specific points in space. Due to the numerous applications of acoustic wave guiding, these concepts could enhance the versatility and multifunctionality of acoustic arrays by a more straightforward mechanical reconfiguration approach that controls the radiated or received wave field. Alternatively, by strategically integrating with digital signal processing methods, future studies might uncover new synergies of performance capabilities by using actively controlled, origami-inspired acoustic arrays. R.L. Harne, D.T. Lynd, Origami acoustics: using principles of folding structural acoustics for simple and large focusing of sound energy, Smart Materials and Structures 25, 085031 (2016). D.T. Lynd, R.L. 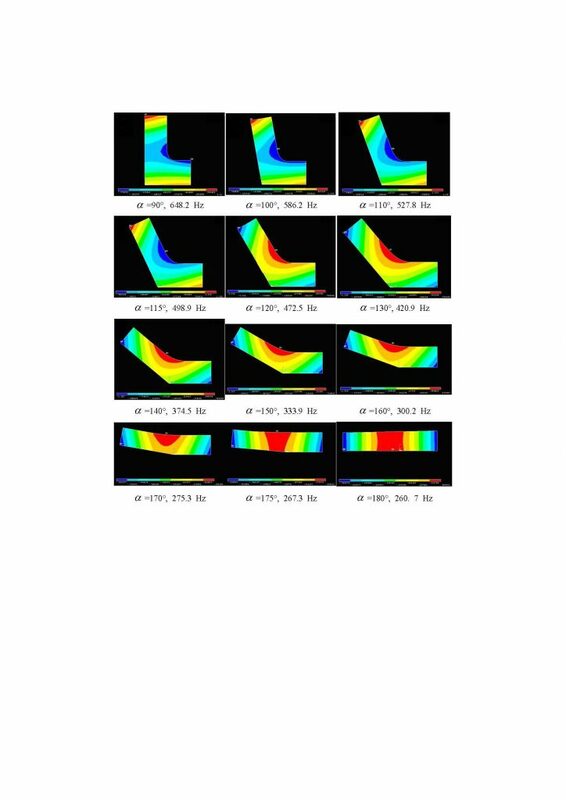 Harne, Strategies to predict radiated sound fields from foldable, Miura-ori-based transducers for acoustic beamfolding, The Journal of the Acoustical Society of America 141, 480-489 (2017). C. Zou, R.L. Harne, Adaptive acoustic energy delivery to near and far fields using foldable, tessellated star transducers, Smart Materials and Structures 26, 055021 (2017). There is at least one toilet in your apartment, sometimes two for a house or even three toilets for a midrise building. There are lots of toilets are in school. Wow! Toilets are everywhere! How loud is a toilet flush sound? It is about 92 decibels. Since human hearing is less sensitive in lower frequency regions, we only hear it as about 85 decibels. 85 decibels is as loud as a truck driving by in front of you. Since most people desire to sleep, work, and study in a quiet space, when someone flushes a toilet, our sleeping can be disturbed or our concentration broken. Thus, how good is your washroom wall, door and window at reducing the toilet flush sound while you are sleeping, working or studying? As in most cases, a typical single layer of gypsum board wall is used and doesn’t reduce much of the low frequency sound, as Figure 2 shows. So, during work, study or sleep, you will still probably hear the “hmmmmmmm” sound. 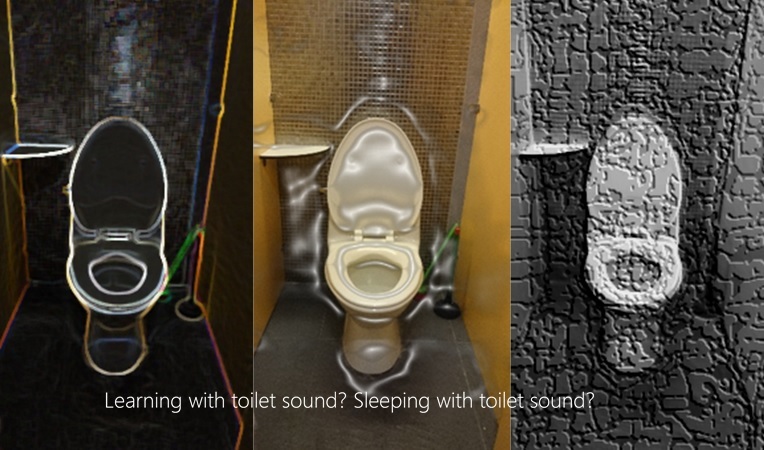 The simulated sound below assumes there are only walls, and no windows or doors in the washroom. 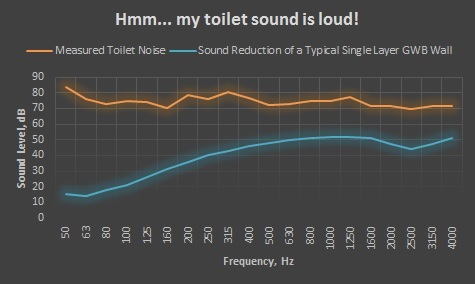 This research is to show how loud the washroom equipment sound can be and what kind of proper noise control an architect should consider using when designing washrooms in spaces like bedrooms and classrooms. 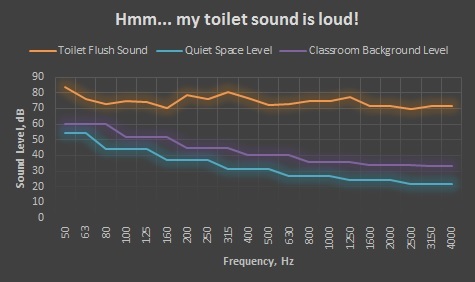 We measured and analyzed sound pressure levels of washroom equipment. 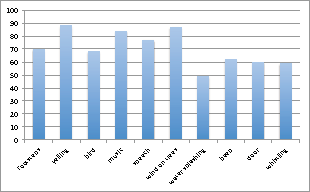 We also analyzed sound transmission class and its frequency spectrum of some typical washroom partitions to see if these partitions could reduce washroom equipment sound sufficiently. In short, a wall that blocks toilet flush sound is necessary in our homes, classes, and offices. How stones make musical sounds? (Undercut or side cut of bars for making musical sound? When you hit a rectangular bar, it makes sound. But the sound is not necessarily nice to hear because the higher mode frequencies are not tuned in harmony. Empirically, people have gotten to know that changing geometrical shapes is a way of tuning sounds. 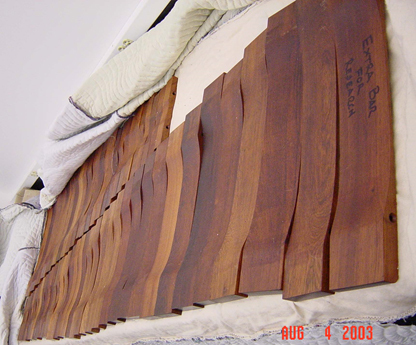 For example, undercutting the bars, like for xilophone or marimba bars is a familiar method. The middle part of each bar is undercut and as a result the 1st mode frequency is lowered as the 2nd mode frequency becomes 4 times higher than the 1st . This change of mode frequency ratios makes the good sound. When we search for the frequency ratios of marimba bars along all 5 octaves, we found the same ratios as Figure 1. The frequency ratios of the 2nd mode frequency to the 1st mode frequency are shown as 4.0 in most bars except higher note bar . This produces the tone quality of marimbas. Are there any other ways of tuning rectangular bars? 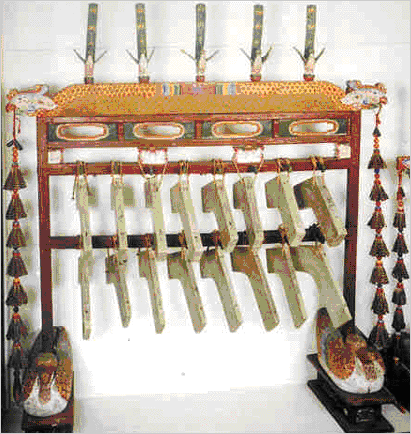 Korean stone chimes, called pyeongyeongs (Figure 2), provide another example of tuning sound by change geometrical shape of bars . In Asian countries, stone chimes have been cherished musical instruments from the Stone ages . Does the shape only have such a philosophical meaning without any acoustical meaning? In this study, we examine the effects of geometry on the tuning and the sound quality of stone chimes. By changing the vertex angle from 0 o to 180 o and the shapes of the base line, we estimate modal shapes and modal frequencies by means of finite element methods, and these results are compared to modal shapes and frequencies of existing stones, determined by holographic interferometry and by experimental modal testing . 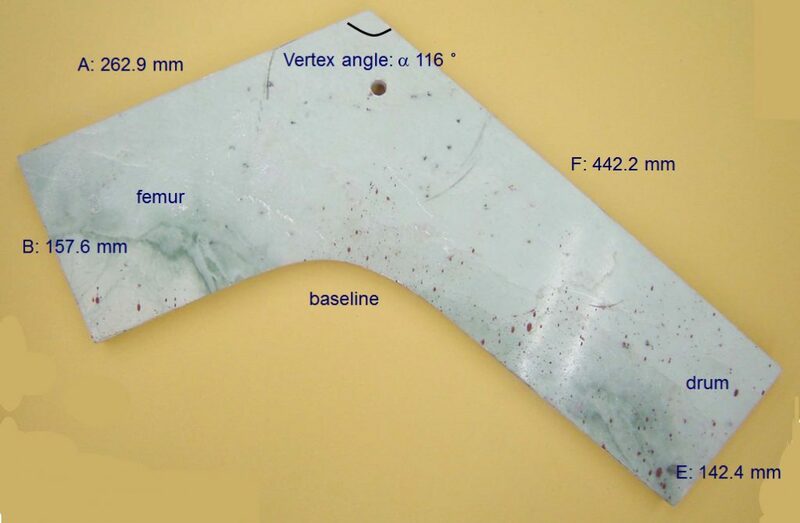 At the end, we can conclude the existing shape of Korean L-shape stone chime with 115o vertex angle and the concave curved base is the optimized one. Also, we measured and analyzed frequencies of historical 261 pyeongyeong stones mainly from the 14th to 19th centuries to confirm the above conclusion. Figure 5. Frequency-dependence on vertex angle α in chime like models: (a) Fundamental frequency and vertex angle, on alternative gyeong models. 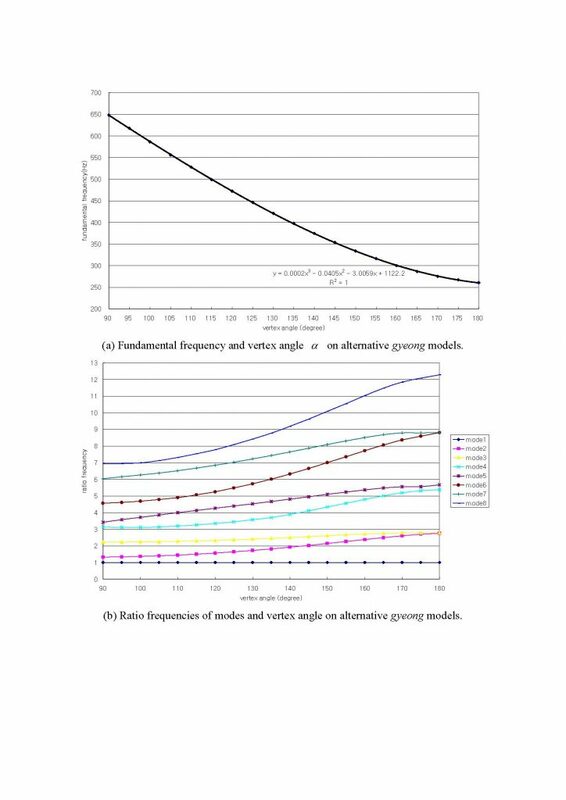 (b) Ratio frequencies of modes and vertex angle on alternative gyeong models. Yoo, J., Rossing, T. D., and Lakin, B., Vibrational modes of five-octave concert marimbas. Proceedings of SMAC 03: Stockholm Musical Acoustics Conference 2003. 2003: p. 355-357. 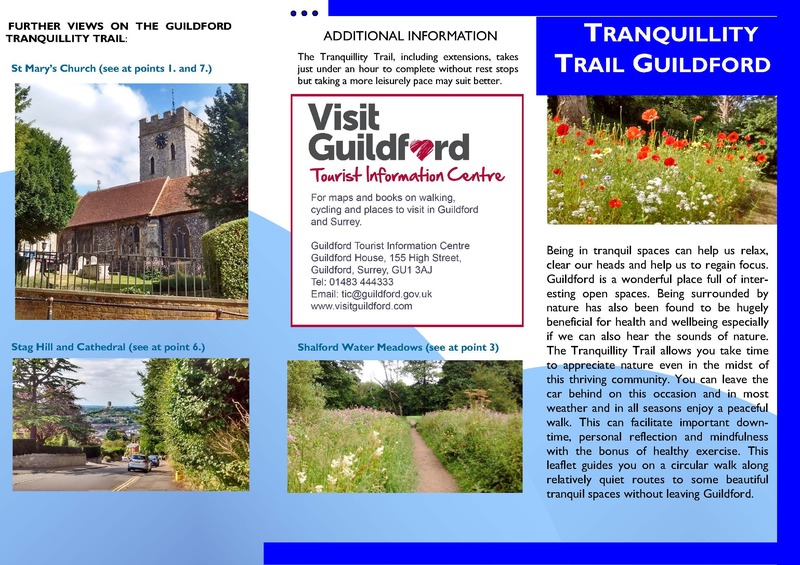 Tranquillity Trails in the city? Tranquil spaces can be found and made in the city, and their promotion and use by residents and visitors is an important means of building resilience. Studies have shown that spaces rated by visitors as tranquil are more likely to produce higher levels of relaxation and less anxiety that should ultimately result in health and well-being benefits. Such spaces can therefore be classed as restorative environments. Tranquil spaces are characterized by a soundscape dominated by natural sounds and low levels of man-made noise. In addition, the presence of vegetation and wild life has been shown to be an important contributory factor. Levels of rated tranquillity can be reliably predicted using a previously developed model called TRAPT, and then used it to design and identify tranquil spaces, improve existing green spaces and develop Tranquillity Trails to encourage usage. Tranquillity Trails are walking routes designed to enable residents and visitors to reflect and recover from stress while receiving the benefits of healthy exercise. This paper describes Tranquillity Trails designed for three contrasting areas. 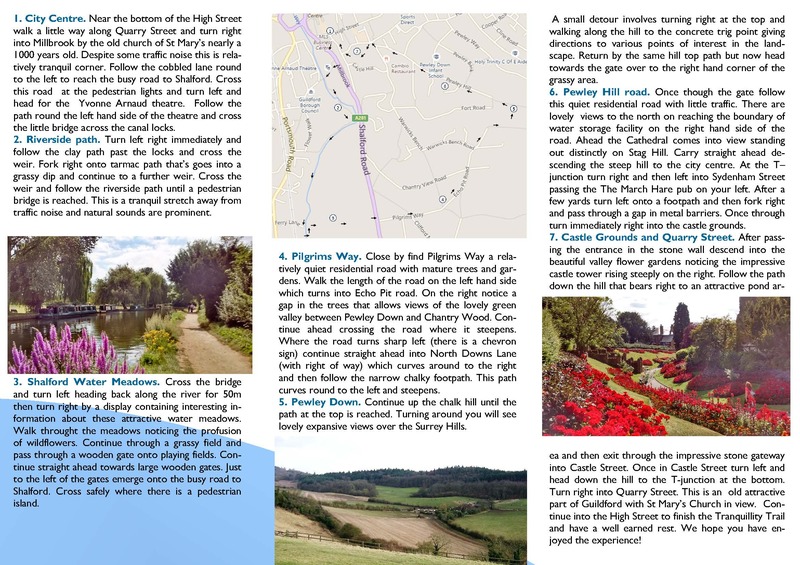 Predictions of the rated tranquillity have been made along these routes and feedback from users was elicited at one site that confirmed the expected benefits. The aim is to design a route that starts near the center, is simple and safe to follow and will allow users to experience a relatively degree of tranquility despite being in an urban area. Clearly the challenge is greater in a city with higher concentrations of people and traffic than for a town. The first three TTs designed are in Bradford, Kingsbridge and Guildford. These are all in England, though further ones are currently being develop in the US, Ireland and Hong Kong. Popular version of keynote talk “Computational analysis of acoustic events in everyday environments”. Sound carries information about physical events in an environment. For example, when a car is passing by, we can perceive the approximate size and speed of the car by its sounds. The automatic recognition of sound events in everyday environments (see Figure 1) through signal processing and computer algorithms would therefore enable several new applications. For instance, robots, cars, and mobile devices could become aware of physical events in their surroundings. New surveillance applications could automatically detect dangerous events, such as glass breaking, and multimedia databases could be queried based on their content. Figure 1: Sound event recognition methods analyse automatically events within an audio signal. Credit: Heittola/TUT. However, automatic detection of sounds is difficult, since the acoustic characteristics of different sources can be very similar, and there is no single, specific acoustic property that could be utilised for recognition. Furthermore, in realistic environments, there are typically multiple sound sources present simultaneously and their acoustic sources interfere with one another, forming a complex mixture of sounds (see Figure 2). Figure 2: Sound carries lots of information about physical events in everyday environments. 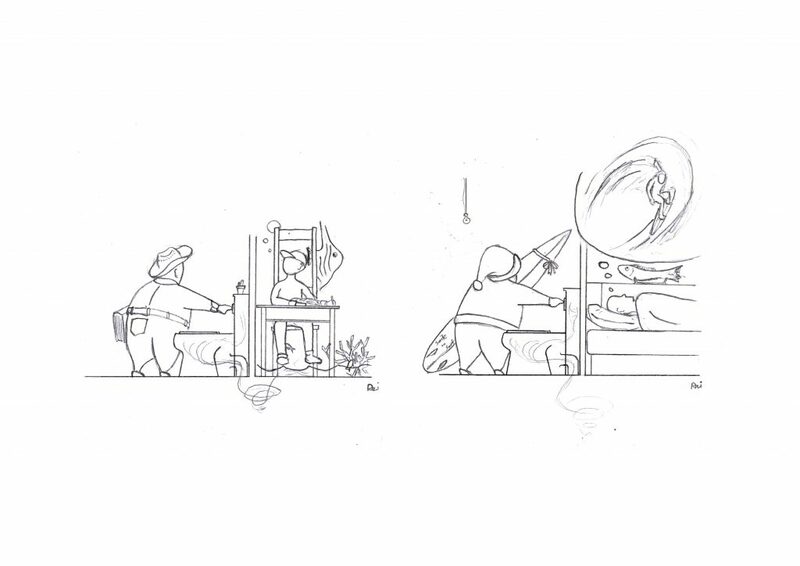 Realistic sound scenes consist of multiple sources which form a complex mixture of sounds. Credit: Arpingstone. In my keynote speech, I present a generic approach to sound event recognition that can be used to detect many different types of sound events in realistic, everyday environments. In this technique, computer algorithms use machine learning to compile a model for each detectable sound type based on a database of example sounds. Once these models have been obtained at the development stage, they can be deployed to provide an estimate of the sound events that are present in any input audio signal. State-of-the-art machine-learning models and algorithms are based on deep neural networks . 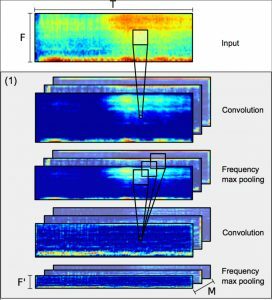 They mimic the processing in the human auditory system by feeding the input audio signal through a sequence of layers that automatically learn hierarchical representations of input sounds (see Figure 3). In turn, these representations can be used to estimate and recognise which sounds are present in the input. A recent study conducted at Tampere University of Technology shows that it is possible to recognize 61 various types of everyday sounds, such as footsteps, cars, doors, etc. 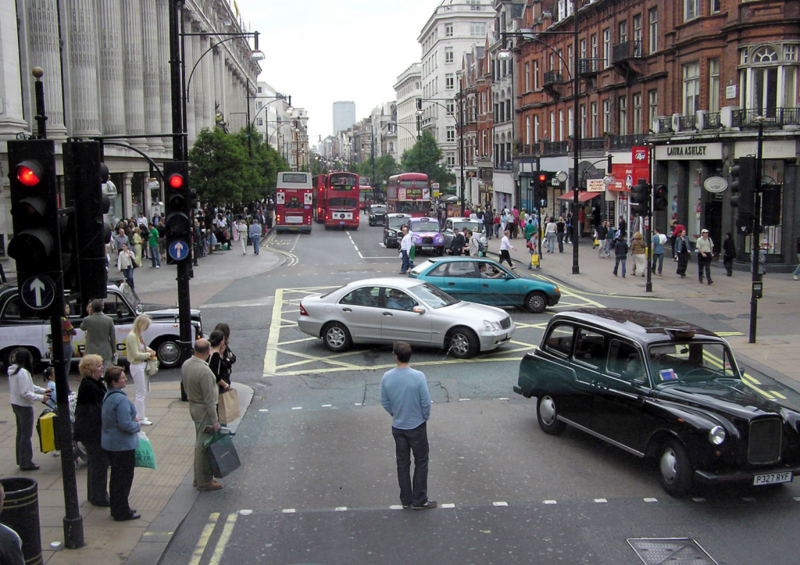 correctly 70% of the time in everyday environments, such as offices, streets, and shops (see Figure 4) . The study also demonstrates how advanced neural network architectures can provide significant improvements in recognition accuracy. The accompanying video (Video 1) illustrates the recognition output of the methods in comparison to manually annotated sound events. Video 1: Sound events automatically recognized from a street scene (orange bars). Manually annotated target sounds are illustrated with blue bars, and cases where the automatic recognition and manual annotation coincide with brown bars. Credit: Çakır et al./TUT. E. Çakır, G. Parascandolo, T. Heittola, H. Huttunen, and T. Virtanen. 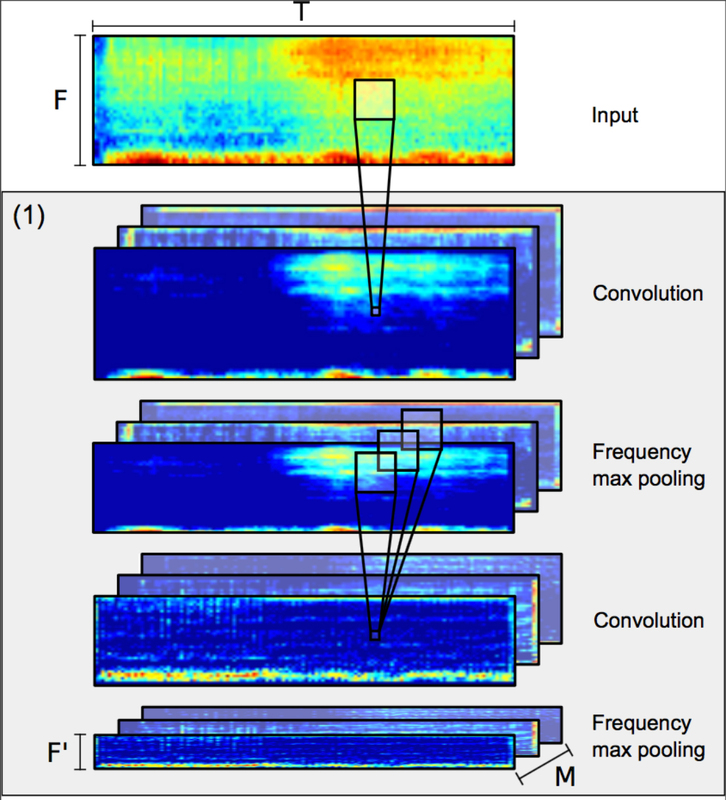 Convolutional Recurrent Neural Networks for Polyphonic Sound Event Detection. IEEE/ACM Transactions on Audio, Speech, and Language Processing, Volume 25, Issue 6, 2017.